Designed by AnnaFesta for FestaSports this jacket comes directly from the runway to your closet. - Attached hood with eco-friendly faux fur lining. - X-Long sleeves with thumbhole to keep hands warm. - Two front pockets and two inner pockets. 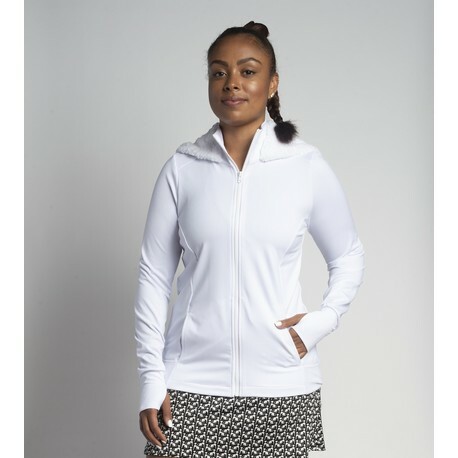 - Made from our fantastic wick-away fabric for quick dry, breathability increasing air flow to keep you cool, antibacterial quality with odor resistance, and UPF 50 all day sun protection, all created in an environmentally friendly process*. XS - 24", S - 25", M - 26", L - 27", XL - 28", 1 - 29", 2 - 30", 3 - 31"